Fire can cause great damage but in parts of Africa such as the Okavango Delta in Botswana fire is an integral part of the cycle of life, providing opportunity for growth for a number of key plant species. 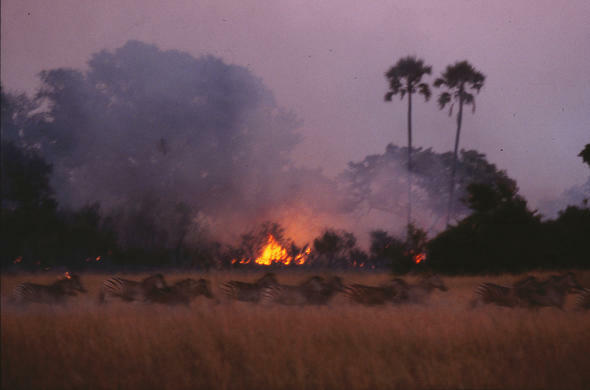 As in many wilderness areas in Africa fire is a necessary part of the Okavango eco-system, needed for the burn-off of old vegetation and for the regeneration of plants. The causes of many of the fires in the delta today are different to the natural causes of the past. Today most of the fires are deliberately set by man to clear vegetation for agriculture and fishing - and in some cases are set by safari operators to bring on new grass in order to attract animals to their lodges. Whatever the reason for the fires to start they burn in the delta every year, brushing the sky in a dull haze of grey-blue. Tall grass that has grown after the evaporation of the water on the floodplains burns easily and quickly - and papyrus beds are perfect fuel for the delta fires, exploding in sound when the flames reach the stands. Dry papyrus also poses the danger where the roots smoulder underground and ignite vegetation on the surface when the smouldering reaches the end of a firebreak or a cleared area. Many times it has been seen where firefighters have extinguished a fire only to have it reignite some distance away. The animals of the delta have experience of fires and generally keep their distance, but will run through flames if in danger of being trapped. Smaller animals that cannot move fast enough often succumb to the smoke and flames. The sky during the season of fire is washed in grey and the air is scented in the sharp smell of burnt grass. The sun is dulled behind the smoke and in the late afternoon it sinks to the horizon as a huge ball, providing spectacular photographic opportunities.